The Erosion Control Magazine focused on a project aimed at protecting coral reefs in the Guánica Bay, Puerto Rico, where Maccaferri US provided supplies and our expertise. A coastal protection project in Puerto Rico, which Maccaferri US contributed to by providing Green Gabions and our know-how about coastal protection issues, was the focus of a story featured in the March-April 2016 edition of Erosion Control Magazine, a publication by Forester Network. The article deals with a major project aimed at protecting coral reefs in the Guánica Bay. 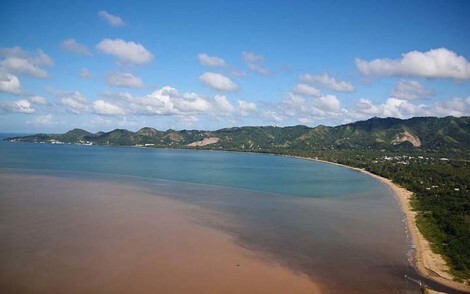 Its primary goal was to stop erosion at the site and reduce sediment flowing into the Guánica Bay. The design included structural protection of the riverbank with gabions and stream banks. Bioengineering practices were implemented behind the gabions wall as part of the treatment. The focus of the project was protecting a slope along the nearby river that is affected by water volumes during heavy rain events. The Maccaferri Green Gabions that were deployed at the site are modular gabion units used for streambank stabilization, restoration, and erosion control. They are designed for use with soil bioengineering techniques such as live staking, brush layering, and rooted plants. Basically, a Green Gabion is a basket manufactured from heavily galvanized and polymer-coated double-twisted hexagonal woven steel wire mesh lined with a 100% coir blanket. The unit is then filled in place with gabion stone, and the voids between the stones are filled with quality topsoil before the unit is closed. The topsoil allows plant establishment, and the stone fill provides a tough skeleton to the system. The installation of Green Gabions on the top row of the wall was a first for the Natural Resources Conservation Service in Puerto Rico. The approach was designed to help secure the structural treatments and also provide for enhanced aesthetics as well as some habitat benefits. For further information about this project, feel free to contact us.